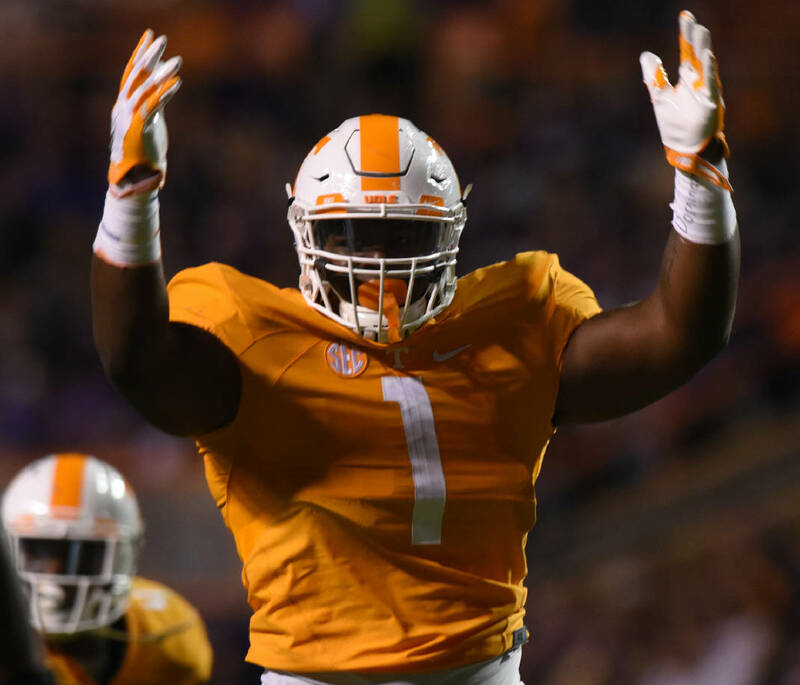 UT's Kahlil McKenzie celebrates a recovered fumble in a game against Western Carolina at Neyland Stadium in Knoxville. KNOXVILLE — When the Tennessee football team practices in full pads Friday for the first time since the spring, it might be a little bit more exciting for junior defensive tackle Kahlil McKenzie than for most others. "Not being able to put pads on for a long time and then putting them back on, it's going to be great," McKenzie said. The former five-star prospect was in the midst of his first career start against Alabama last season when he went down in the first quarter and did not return, his season over just minutes after he had reached a monumental height. "You never want to say you turn the corner or anything like that, but you're on a rise and feeling good and then get hurt," McKenzie said. "So it's all in God's plan, just going through it and working through it." Defensive lineman Kahlil McKenzie (99) takes a break on the bench. The University of Tennessee Orange/White Spring Football Game was held at Neyland Stadium in Knoxville on April 16, 2016. 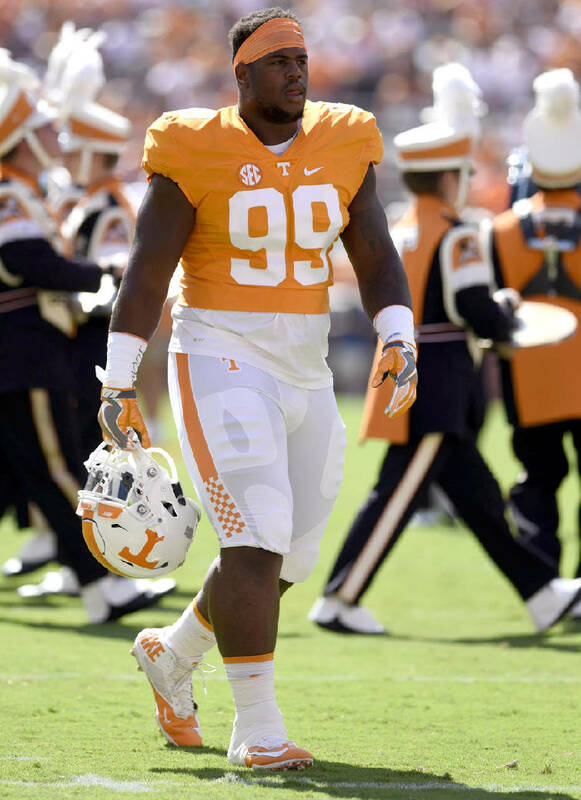 Kahlil McKenzie (99) plays on the defensive line for Tennessee. The Ohio University Bobcats visited the University of Tennessee Volunteers at Neyland Stadium in a non-conference NCAA football game on Saturday September 17, 2016. McKenzie's pectoral injury was just one in a series of injuries that decimated Tennessee's defense during a 9-4 campaign that included late-season losses to Vanderbilt and South Carolina before a Music City Bowl win over Nebraska. Those lows and the finishing high came with McKenzie on the sideline developing a new appreciation for the game. "Injury definitely changes your look on practice," he said. "You love being out here around your teammates more and more. It just gives you a newfound appreciation for being out here with your teammates." McKenzie wore a no-contact jersey and was a limited participant in spring practice. Now, after a June and July spent in the weight room regaining power under first-year strength and conditioning coach Rock Gullickson, McKenzie is in position to earn his second career start when the Volunteers open the 2017 season against Georgia Tech in Atlanta on Sept. 4. "We're in helmets, but I like everything I've seen from him, not just on the field but in a leadership role as well," head coach Butch Jones said. "For a defensive lineman it's all about technique right now, using your hands, the fine details. We'll know more, obviously, when the pads come on." McKenzie is joined by fellow juniors Alexis Johnson, Quay Picou and Shy Tuttle in a group of defensive tackles led by fifth-year senior Kendal Vickers. Vickers represented Tennessee at the Southeastern Conference's media days in July and has been praised by coaches for his leadership. 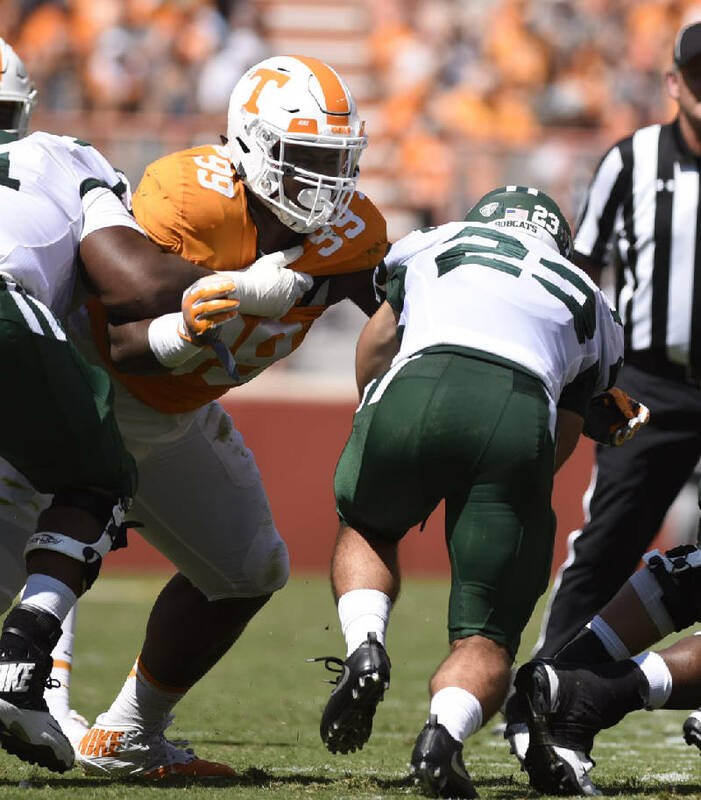 But, as Jones alluded to, McKenzie sees himself stepping into a leadership role as the Vols welcome several freshmen to the defensive line. "You're a mentor, you're making sure other guys are doing things right," McKenzie said. "You're getting on other guys, just 'Hey, I know how it is.' You just keep them up to pace, because it's fast out here. It's not high school football. Some guys, you've got to bring them along. I was just like that my freshman year, so it's a different aspect." McKenzie said "everybody" is ready to put the pads on — although the occasion may be a bit more significant for him. "As a team, we just feel like now is the time," McKenzie said. "It's now or never, so we're just out here ready to shock the world and ready to do what we all came here to do." Kahlil McKenzie (99) tackles a Ohio ballcarrier. The Ohio University Bobcats visited the University of Tennessee Volunteers at Neyland Stadium in a non-conference NCAA football game on Saturday September 17, 2016.